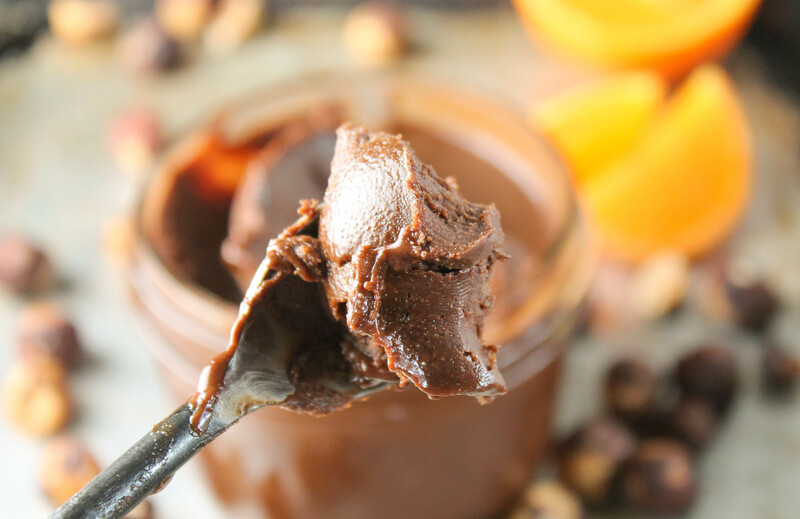 Real food homemade nutella is easier to make than you would think! With some simple ingredients and a good processor, you are on your way to making this popular spread with all real food ingredients! And as an added bonus, it is dairy free and easily made low-carb and sugar free! Who doesn’t love chocolate and nuts? There are not many out there that don’t have at least some fondness in their being for this perfect marriage of ingredients. I have been wanting to create a homemade Nutella for sometime….it is SO delicious on SO many things. But the original, while delicious, is SUPER high in sugar. Like, over HALF sugar!! In fact Sugar is the very first ingredient! And since it is not labeled GMO Free, there is no guarantee that sugar doesn’t not come from GMO sugar beets. So why not make my own and control the quality of the ingredients and make it dairy free to boot?! Then I can be happy serving it to my kiddos for breakfast on their beloved crepes! 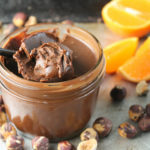 I know my kids will be clobbering for more of this homemade Nutella, the only hard part is showing some restraint! Everyone I have shared this with goes nuts for it ( no pun intended! )…a perfect gift to make a hand out too! I attempted to be lazy and decided to forgo the removal of the papery skins on the hazelnuts one time: DON’T DO THIS!! The flavor is still great, but the texture is all wrong…gritty and thick! And if muscling those pesky skins seems annoying to you, you can always buy pre-peeled hazelnuts! In Europe where there is cult like following for this bread, it is spread on a piece of toast. Try my perfect soaked teff bread….gluten free AND vegan!! Spread on orange slices, strawberries, or bananas. Nutella & Jelly sandwich or wrap!! Or instead of jelly, fresh strawberries or raspberries! As a nutbutter replacement in any recipe. Like hazelnuts as much as we do? Here are some additional recipes you cold try! 1/2 cup powdered sugar Whole Foods and Trader Joe's brands are corn free, powdered palm sugar or Swerve work too:whir them in a coffee grinder or high powered blender to achieve a powdery consistency! 2-3 tablespoons coconut oil or other oil (depending on the consistency you prefer) The coconut oil will firm up the spread as it cools, other oils will not. Scatter hazelnuts in a single layer on a cookie sheet. Roast the nuts for about 10 minutes until you can smell them and they are golden brown. Place nuts on a dishtowel, fold it over, and rub vigorously to remove the papery skins. Be patient, this can be a pain. If a few skins are left, no biggy, it will still taste delicious! Place nuts in a food processor (I LOVE mine!) and process for several minutes until the hazelnuts turn creamy. Add in the remaining ingredients and blend well, scraping down sides if necessary. I like to run mine through my high powered blender for an extra creamy texture. Spoon into an airtight container and store in the fridge to preserve freshness! You could also place into small canning jars for a decadent handmade gift!! 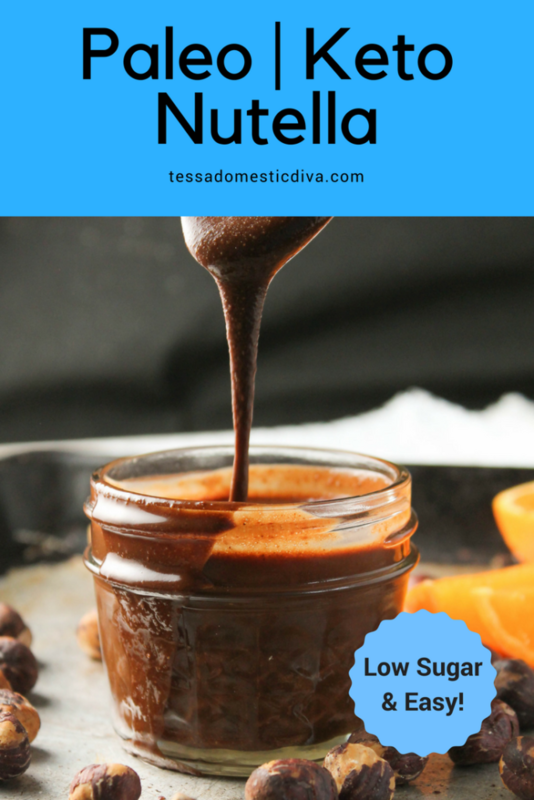 We are huge Nutella fans and will have to give this a try! Yum! I love a healthy twist on a favorite spread! Am I the only one who gets a twisted pleasure from removing the papery skin?! I had to do it all the time at one of the restaurants I worked at and I really liked doing it! i think you might be Leslie!! Funny!!! I need to make this, for sure! I love your tip for definitely peeling the hazelnuts; thank you! And yay that roasting makes that step so easy! This looks AMAZING!! This recipe has literally made my day. I will be making it with monkfruit sweetener to keep it keto and I can’t believe that I can have something so luxurious. Thank you so much!!! Indeed you can…and it is SOO good Yvonne!! Hope you enjoy it! I feel like I have been waiting for this recipe all my life!! Thank you so much for sharing, I’m definitely making up a few jars of this! Interesting timing! I had just picked up a jar of Nutella in the grocery store the other day to look at the ingredients. I had suspected it was high in sugar, but shocked that it was the first ingredient! I was surprised to see how popular it is in Europe when we were there a few years ago. Their jars are huge! Thank you for providing this more healthful alternative. How good is homemade Nutella. 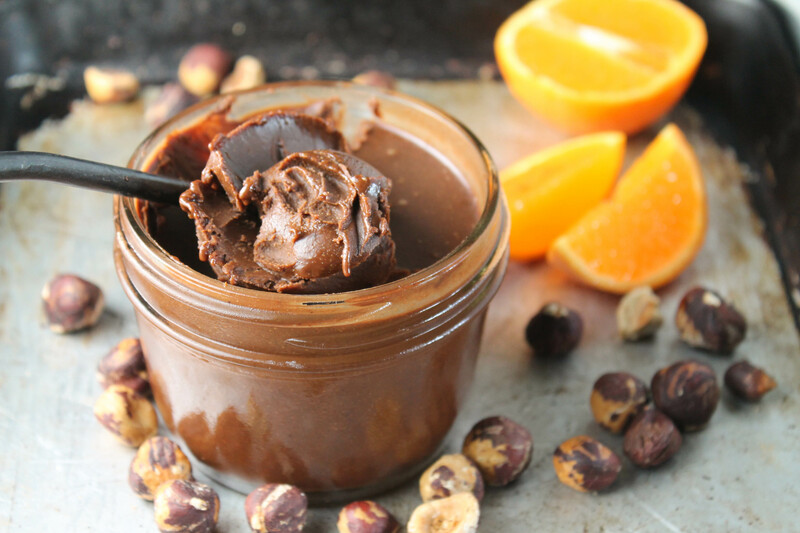 The taste, the smell, the ease of getting your (healthy) chocolate fix! This looks awesome. Oh my I need a spoon and I’d devour that entire jar!! That looks incredible!! I can now get my friends off of their store-bought Nutella. Thank you for the read food recipe! linda spiker recently posted…Grilled Naan Pizza with Roasted Butternut Squash! Oh my goodness. Give me a spoon! I accidentally made a version of this last week and thought to myself “what took me so long to make this?” Hazelnuts are really hard to come by here in South Florida sadly but I will be making this again with other types of nuts! I used to eat Nutella by the spoonfuls in college! Love your clean version and I definitely wanna try to make it at home now. probably Zsofia!! Try the same rubbing in towel technique. If they are not budging, you could heat the slightly and see if that helps! Oh hazelnuts, how this nut allergy mama misses you! This looks awesome! 🙂 Got it tweeted and pinned! ( : welcome welcome welcome Martine! Ha–not three hours ago, I was in my pantry thinking ‘Man, I need to learn how to make Nutella from scratch.’. My husband loves this stuff, and I’ll be happy to be able to give him something with fewer additives. I was just telling my husband I had to make him Nutella so he would stop eating it when we visit his parents!! Thanks! I need to try your recipe, instead of buying the jars. you can read all these ingredients Lisa!! Thanks for sharing Paula, enjoy…I am making a batch today in fact! 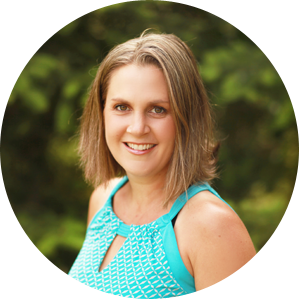 I have no food allergies but prefer organic all the way and maybe you like to check out some of my recipes which I posted since I moved to the USA. Particularly the French Herb Bread I love. I use Bobs Red Mill Spelt flour. MY blueberry wine vinegar is a hit even by my husband who doesnt like blueberries! Who doesn't?!! I guess my husband…he has yet to try it…poor soul! You are amazing!! You know that I love Nutella!! !